Don’t leave your connection to the outside world looking a little worse for wear. Here at Repair Mate, we can remedy all screen related issues, from slight cracks to completely smashed. We use quality replacement parts, including glass screens, to complete each job to ensure your mobile is looking good as new. An iPhone 5 screen repair takes around 1 hour and we offer customers a warranty when we’re done. The price is inclusive of Parts, Labour & GST. No Additional charges. What was the repair cost advertised? Where did you see this cost? iPhone 5 is considered to be the customer’s favourite in its time. Every smartphone has its weakness and some weaknesses are present in almost all smartphone. One of the major weakness of the iPhone 5, which is of almost all smartphones, is the vulnerable screen. Some unwanted incidents may lead to the damage of these screens which leaves us heartbroken. The LCD might as well get damaged due to accidents and your device will then require an expert to repair LCD screen of your iPhone. This is where Repair Mate comes in with a team of highly trained and expert technicians to serve you one of the best repairs in Australia when it comes to iPhone screen repairs. The two components of the screen of Apple iPhone 5 are the screen and the LCD. If your screen is smashed leading to damaged LCD, you will be needing a quick fix from the experts and you have come to the best place for an easy solution. Most of our repairs are completed within 30-60 minutes, including this LCD screen repair of iPhone 5. After just about an hour or so you will receive your dear device with a repair that makes it working and looking like new. Our website also has an easy online booking system. The booking will ensure that the parts are reserved for your repair and our experts are prepared to receive and repair your device. What’s more, we use high-quality parts for all our repairs. We are focused on providing quality repairs for our customers and hence do not compromise on the quality of parts. Our trained technicians are an expert when it comes to replacing the screen of Apple iPhones with the highest quality parts and will do everything in their power to bring back your device to life as well as to make it work like new. Would you like to know how to book repair for your device via our website? Just have a look at the video below! 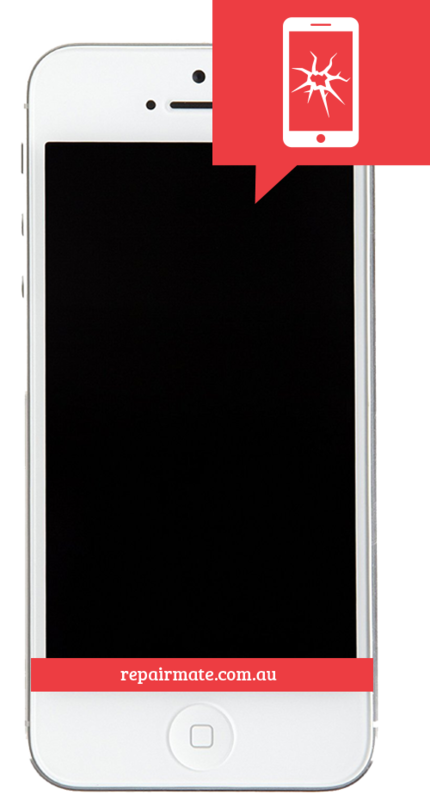 Repair Mate offers Apple phone screen replacement in all our repair shops in Melbourne & Sydney. Little Collins Street, Melbourne CBD is the home to our Repair Mate Melbourne CBD store and also is one of the most professional repair centres to get iPhone device repaired in Melbourne. We can proudly say that our repair services are fast, professional, reliable which are possible only with the help of our qualified, experienced and very friendly staff. We are very confident about our repairs, and hence, provide a 90 days warranty for all our customers. So, drop in Repair Mate for iPhone 5 screen replacement service in Melbourne. Repair Mate also provides its repair services from Repair Mate Express Carnegie. We serve iPhone 5 screen replacement service like no other and also have 90 days warranty if issues are seen with the parts that we installed. Come, visit our store at Carnegie Central to get a fast, reliable and professional mobile phone repairs. We are now in 99 Bathurst Street, Sydney CBD to cater to the repair needs of our Sydney customers as well as customers from all across Australia. Repair Mate Sydney CBD is one of the highly recommended repairers in the area. We stock a large inventory and are ready to repair your iPhone 5 screen in just about an hour! Hurry and give your Apple iPhone 5 repair it deserved and make it look as well as work like new. This repair applies for iPhone 5 that has cracked, damaged, broken or smashed screen. The damage to LCD & Touch of iPhone 5 will be repaired under this repair. This repair also includes devices with dead pixels, vertical lines as well as back spots. What does the Warranty comprise of? The warranty on most of our repairs ranges from 30 to 90 days depending upon the type of repair. Our warranty cover defects in the parts that we use on the repairs or the labour associated with it. We do not cover issues that arise from physical damage. We are a third party repair shop meaning that if you have a device with a manufacturer warranty then, that warranty will be void once the device is repaired with us. Also, You cannot claim your manufacturer warranty with us. If you need to claim warranty on repairs done by us, please visit the store you repaired indirectly. The staff there will take the device under observation and assess it. If its eligible for repair we will cover your device under our warranty policy. Having said this, this device will not retain its waterproofing feature after repair. For the convenience of our customer, we provide different payment options. We accept payment from Mastercard, Visa, American Express. Also, the customer who wish to pay in instalment, we offer the OXIPAY system so that you can give out payment every fortnight..
Over thousand Repairs makes us Melbourne's most trusted repairer! We make it simple, easy and hassle-free to get your device back to working order with any fault. Our technicians are trained for iPhone 5 Screen & LCD Replacement [High Quality] to perfection, where each component is seated properly and each screw tightened enough to ensure a firm hold. Device manufactured with water-proof ability might not retain water-proof ability and manufacturer's warranty might no longer be valid after device being repaired. Repair Time are estimated repair time in best case scenario and parts required being available in stock. Cost is estimate only & subject to change anytime without notice. Some areas might be outside our courier pick up zone and no postage credit is offered when handset is sent by the customer.